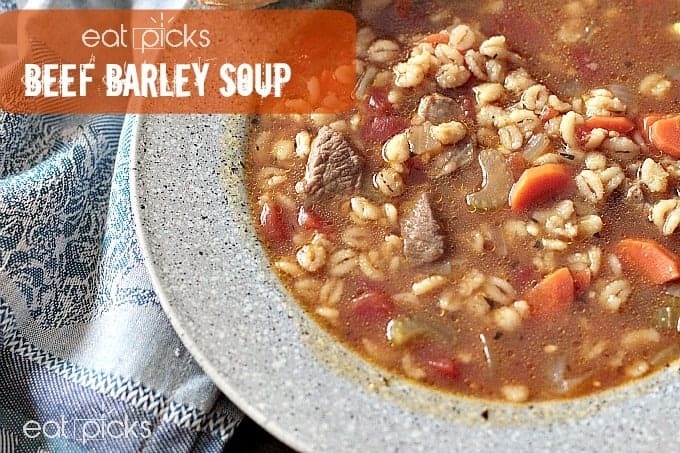 Soup is soul food and when made with hearty beef, barley, and vegetables, it’s like getting a big hug on a really cold day. 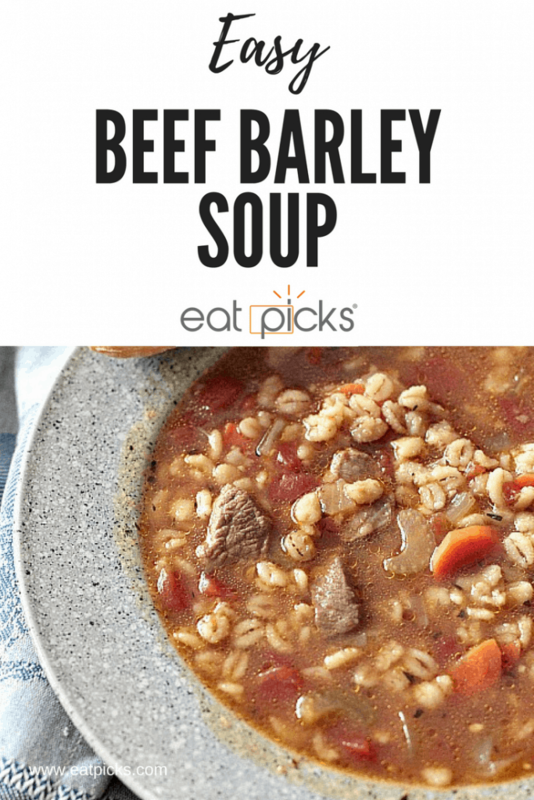 Follow along as we share our recipe for Easy Beef Barley Soup! Thanks to Moyer Beef for sponsoring this post. All opinions are my own. I don’t know about you, but when the weather takes a turn toward the cold and dreary direction, I pull out every recipe in the file book for hearty, hot soups. I like to have something quick and simple because I don’t really like to wait and as every cook knows, simple always tastes good! This easy beef barley soup is full of juicy bite-sized morsels of Moyer Angus Beef, quick-cooking barley, vegetables and broth, and can be ready in less than an hour. Honestly, I love soup any time of year, but I really crave it on blustery days, filled with rain or snow. Putting a pot of soup on the stove fills the house with “cozy” aroma and makes you want to grab the thick woven throw from the back of the sofa, curl up with a good book and a savor a steaming cup or bowl of goodness. I went to my local market, grabbed some Moyer Angus Beef (Check here for a store near you!) sirloin, carrots, celery and beef broth and came straight home to put on some soup! It only took 10 minutes to brown the beef and another 10 minutes or so to soften up the mirepoix (diced carrots, celery, onion) in a bit of oil and beef drippings, garlic, broth, barley and tomatoes. I let that cook for 30 minutes or so and dinner was ready! 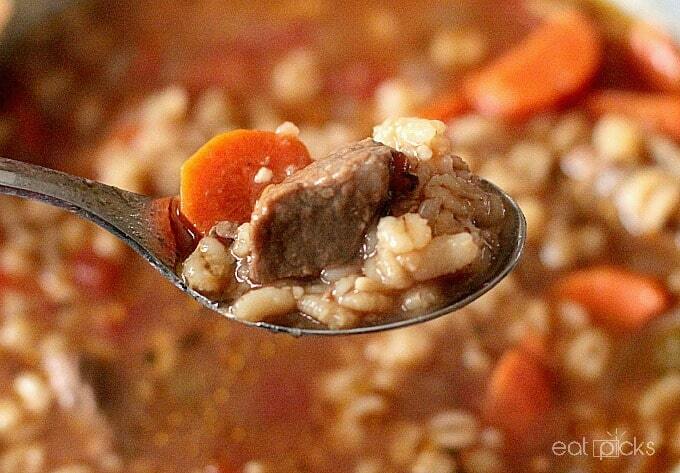 Tender Beef, vegetables and barley cook in a rich beef broth for a meal that warms your soul on cold winter days. Add oil to 5qt dutch oven or pot and heat over medium high heat. Add cubed beef in single layer and brown on all sides; work in batches if need be. Remove cooked beef to a bowl and set aside. In same pan, add onion, carrot & celery and cook until onions are soft and translucent; about 5 minutes. Add tomatoes (and can juices), beef stock, water, bullion, and spices. Add reserved bowl of cooked beef and any drippings from bowl. Add barley and bring to a boil. Turn down to simmer and cover with lid. Serve with a sandwich, salad or artisan roll. I made this last night and it was delicious! Also really easy! It was even better the next day! Thank you for sharing!